We started our day in the cute little town of Keswick, the home of DENTON HOUSE independent hostel, in the north of the Lake District. Keswick is a proper market town, servicing the local area, and had some very convenient shops to provide us with food and other supplies we needed- there were also cute gift shops, sweet shops, and cafes so we paid them a visit to maintain the tourist reputation expected of us. Being the tourists we are, we had to enjoy a visit to a local museum, and I’m so glad we did. There were two museums we knew of: an intriguing pencil museum, and a illusion museum called the Puzzling Place. Puzzling place had been recommended by a friend so we headed there. Inside the museum seemed small at a first glance, but the more I looked the more I started to notice. There were interesting facts and illusions on the walls and on the floor as I walked in, but turning the corner I could see unusual looking equipment and set ups of different objects. All of these were to create illusions- some I had seen before, and others that were confusing, manipulating and believable. The two best features of the museum by far were the illusion rooms. One seemed to be a upside down room which seemed pretty simple at first, but when somebody took a picture of me standing in the room it appeared that I was standing on the ceiling! 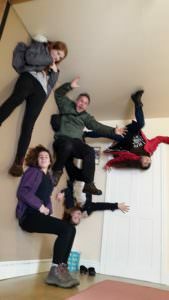 We had lots of fun in this room, creating all sorts of hilarious scenarios of people climbing up walls and falling from the ceiling- you can see one of these pictures that were took here. The second illusion room had a sloping floor and ceiling and when viewed through a viewing window it made the people at one end seem huge and those at the other end tiny. After that it was decided that we were to go on a walk, and being in the Lake District this walk started with a lake. To get to the starting point of the walk we decided to spruce things up a bit and take a ferry ride, but, due to the storms, the jetty that we were going to dock upon was out of order, so we had to start our walk from even further away. This meant a very slightly longer ferry ride, which was great fun! On the ferry we glided past DERWENTWATER INDEPENDENT HOSTEL which looked grand set against the snowy mountains. After the ferry had docked we set out on our walk, and seeing as I was there, we stopped for lunch very soon after. We found a large grassy rock that was only slightly damp, and all 14 of us sat there eating our lunch and enjoying the views of the scenic lake and the iconic mountains in the distance, while our two fluffy faced walking companions wagged their tails, hoping for leftovers. Food all gone and about ready to go home, we continued our walk along the lake side. The sun shone for a little bit, which was surprising, but made the walk thoroughly enjoyable, and I had lots of fun catching up with my friends. After the walk we enjoyed a meal in a pub to celebrate my mother’s birthday. The pub was very unusual. It’s called The Chief Justice of the Common Pleas, which sounds like a rather grim pub name, and is because the pubs was an old court house. This was surprising apparent when we walked in, as the place was still set up as a court house- it was tempting to sit in the judge’s chair! Probably the coolest pub I’ve ever been in! The pub had a very friendly atmosphere and served amazing curry dishes, which I obviously had to taste. I especially enjoyed that day in Keswick, and the rest of my holiday was also just as enjoyable. If I go back I would definitely stay in another one of the independent hostels in the Lake District.